UPDATE: Our voices have been heard! 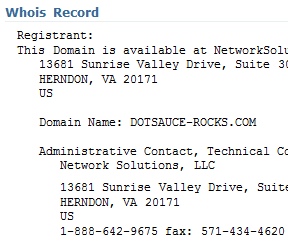 The ICANN Board of Directors a resolution was passed which will end domain tasting as we know it, including this Network Solutions scandal. Read the full story here on DotSauce. There has been an uproar today about a recent devious tactic being used by one of the original ICANN accredited registrars, NetworkSolutions. Apparently they are internally registering each and every domain name that a user searches for using their website, essentially holding it hostage so that it can not be purchased at any other significantly cheaper and more ethical registrar. Network Solutions has instituted a 4 day lock on all domain names searched on their site. They are effectively using phishing techniques to hijack or steal domain names and forcing domain name registrants to register their names at Network Solutions. This kind of tactic can destroy a company’s reputation. Many registrars have been accused of selling their whois search data to domain tasting companies, but never has any company immediately secured domain searches in their name as they are searched for. I urge you to never use Network Solutions and spread the word about this scandalous practice. I contacted ICANN and they said that although they believe it to be an unethical business practice…. it is legal for Network Solutions to hijack domain names and hold them…. ICANN stated that there is nothing they can do to stop the practice. What is the best/safest site to look for domain names? I personally use Moniker’s Bulk Search tool because it is safe, reliable and fast. I then register my desired domain names at GoDaddy for various reasons, mainly that it is the most popular and desirable for domain buyers. 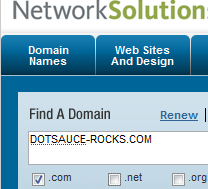 You can discuss the NetworkSolutions situation at DotSauce Forums, NamePros or DomainState. This news has also been announced by other domain industry blogs: Conceptualist, Elliot’s Blog, Dominik Mueller, DomainBits and hopefully more will follow soon.